#Giveaway #RC #Free $25 Walmart Gift Card For You To Get Fresh With The New Olay Fresh Effects!! CLOSED! I am a mom and a wife, but just because I take on those roles does not mean that I am not still a woman. True, when it comes to going all out and doing my hair and makeup, I find that those things take the backseat a lot, but when it comes to keeping my face clean and my skin feeling fresh, I like to find products that do just that, keep my face feeling and looking fresh and clean! 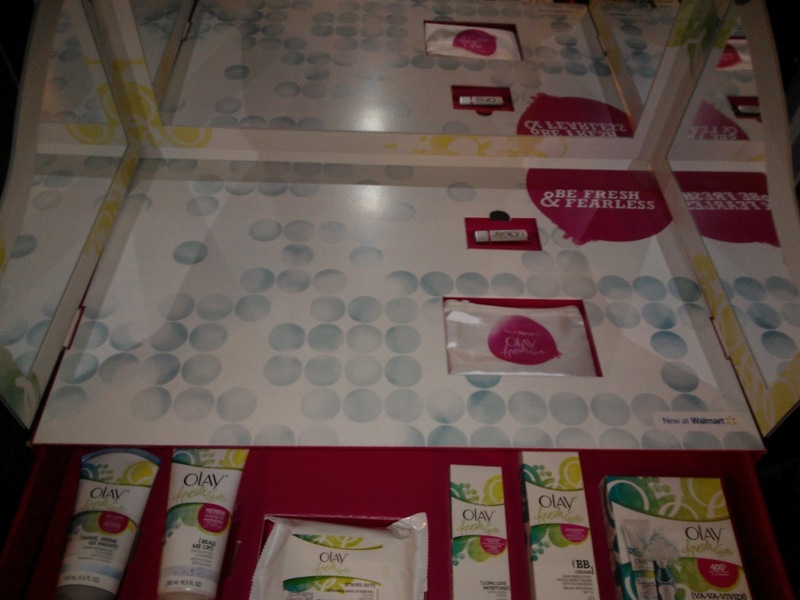 I was sent a great vanity full of of the new Olay Fresh Effects line of products to review! All of the products that I received and reviewed from Olay can be found at Walmart! Check out the video that I made below to get some more info on the Olay Fresh Effects products!! Also after you watch the video, the wonderful people from Olay would like to give one of my amazing readers a $25 Walmart Gift Card, so enter the giveaway on the Rafflecopter form below!! This was not a paid post and honest/original opinions were used and they are my own. Thank you to the company and/or pr agency who supplied the product for review. The products I was sent were from Olay! I like the Shine Minimizing Cleanser the best! I like best the Va-Va-Vivid! I'd like to try the Long Live Moisture.Thank you! I liked the Wipe Out wipes.I entered Bejeweled and Pediped giveaways.Your button is at harvestlanecottage.com at bottom of page.I commented on Land's End. I entered the Barbie in the Pink shoes giveaway. I watched the video and would really like to try the Olay Fresh Effects Bead Me Up! Exfoliating Cleanser. the olay va va vivid is my favorite! Entered the Halo SleepSack giveawaySadie B.
I like the Shine Go Away one! I like the bead me up exfoliating cleanser. Bead Me Up looks great! I would love to try out the Va-Va-Vivid! I'd like to try the Makeup Removal Cloths. I have wanted to try the BB Cream. I would like to try the exfoliating cleanser. I'd like the Olay Fresh Effect Makeup Removal cloths I like to keep a package beside my bed for nights I'm exhausted and forget to wash my face. I know I'd love the Long Live Moisture! I like the make-up remover wipes, I really want to try those. I think I would like the bead me up exfoliating cleanser the most. I like the BB Cream. I entered the Purex/Honey Bunches of O's and the Fellowes giveaways. I also entered the Mother's Day prize pack giveaway! the bead me up exfoliating cleanserthanks for the wonderful giveaway! Been wanting to try the BB Cream.chavonne h.
I like the Shine Minimizing Cleanser. I entered to win the My Little Pony DVD. It looks cute. Olay Fresh Effects BB Cream. I like the Long Live Moisture. I like exfoliating cleanser (I love all exfoliating cleansers) but I haven't have the chance to try this one yet. The make-up remover cloths. I definitely want to try them. I entered the Fellowes Shredder giveaway. I'm really interested in trying the Shine Shine Go Away. I like the makeup wipes. I use baby wipes to remove mascara and it doesn't work well. Favorite – Shine Shine Go Away.I have such oily skin.Thank you. I entered the Nicole Lee giveaway. I like the Shine Minimizing Cleanser the best. I like the exfoliating cleanser. Great review! I like the exfoliater cleanser. Oh the Shine Shine Go Away! I would love that! I like the makeup remover cloths! I like the swipe out! The Long Live Moisture. I love Oil of Olay so glad they are releasing new products. Shine Shine Go Away would be the product I am most interested in. I like this one review from you.. Olay Fresh Effects BB Cream! I've heard so much about bb creams, I'd like to try that. I would like to try the BB Cream. I have heard a lot about it.